Peggy & Co. Solidus vs. Fraction Bar – Peggy & Co. The solidus (known as a slash and many other names) is an oblique stroke going from upper right to lower left, occasionally extending slightly below the baseline. It was formerly written to separate shillings from pence, and now used in numerical dates as in 1/25/58, as a substitute for a conjunction such as in East/West, and ratios. We also have the reverse solidus, known as the backslash. The fraction bar is also a diagonal line, but it is on a more extreme angle, and extends from the cap height to the baseline. It is designed specifically for diagonal fractions, and thus its width and weight is sensitive to each typeface design. Most Pro typefaces have the standard set of fractions – ½ ¼ ¾ ⅓ ⅔ ⅛ ⅜ ⅝ ⅞. 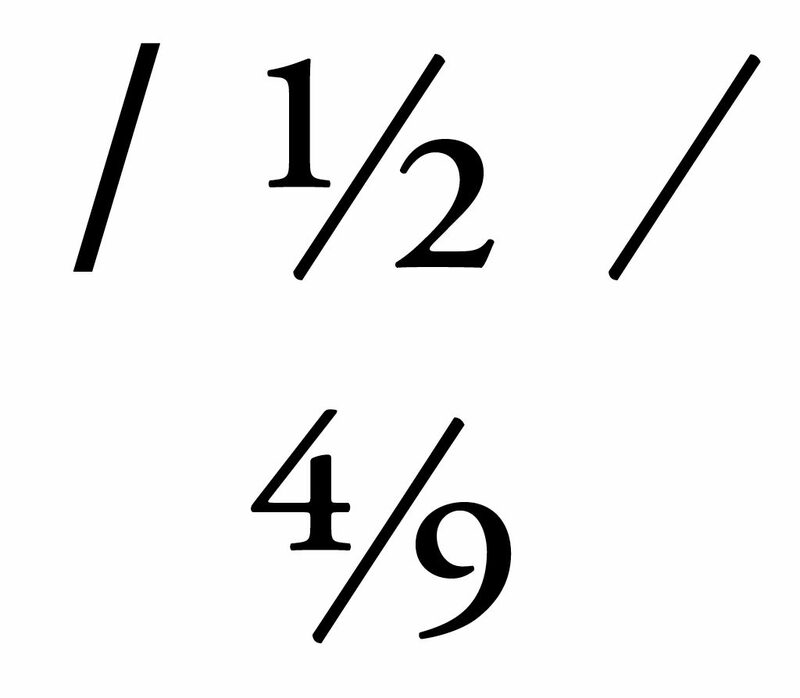 Many typefaces only have a few fraction glyphs (see previous post) and thus the fraction will have to be made up of a superscript number, a fraction bar, and a subscript number. These will need to also be adjusted so that the spacing is correct. Top row: the solidus, fraction glyph, and fraction bar. Bottom row: a fraction set with a numerator, fraction bar, and denominator.